A hospital A&E department would not be safe to reopen overnight, an NHS report has recommended. 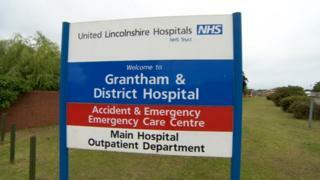 Grantham Hospital restricted its A&E opening hours in August 2016 due to a shortage of doctors. The United Lincolnshire Hospitals Trust (ULHT) had wanted to reopen the department last month following a recruitment drive. The report said the trust should continue to provide A&E services daily between 08:00 and 18:30. It also said there had been "no reported patient harm as a result of the closure". Nick Boles, the Conservative MP for Grantham and Stamford said: "I'm dismayed and furious and sort of just stunned." The MP accused NHS Improvement, which commissioned the report, of attempting "a wholesale downgrade and reorganisation of A&E services in Lincolnshire". In response NHS Improvement said: "We commissioned this report to ensure that any decision made by the Trust is grounded in expert views on patient safety, which remains our top priority in terms of Lincolnshire's A&E services. It said it would continue to work closely with the trust, and other partners, to progress a new model of urgent care for the county, as recommended in the report. Dr Neill Hepburn, medical director at ULHT, said: "We understand this is a frustrating time for our staff and patients and we do remain committed to Grantham hospital, but we will only provide services that are safe." The ULHT board is due to meet on Friday morning.